The 88th running of the Indianapolis 500 on May 30, 2004, will bring together two powerful symbols that stir the imaginations of enthusiasts around the world… Chevrolet and the Indianapolis Motor Speedway… as a 2004 Corvette Convertible will serve as the Official Pace Car of this year’s Indianapolis 500. Corvette will perform Indy 500 pace car duties for a record sixth time. This also marks the third consecutive year and 15th time overall that a Chevrolet product has served as the official pace vehicle – the most appearances by any brand. "We’re proud that this year’s Memorial Day classic will showcase America’s favorite sports car at the greatest spectacle in racing," said Brent Dewar, Chevrolet general manager. "As the 2004 model year is the last of Corvette’s current design, pacing the Indy 500 acknowledges the significance the vehicle has played in American culture." The Indianapolis Motor Speedway has been the site of many memorable events since the facility opened in 1909. Similarly, Chevrolet has a rich heritage in racing that extends back to company co-founder and namesake Louis Chevrolet, a gifted engineer and talented race car driver who competed in the Indy 500 four times. More recently, Chevy Indy V-8 engines have won 103 open–wheel races, including seven Indianapolis 500 victories. "The Indianapolis 500 and Chevrolet have had a long relationship," said Tony George, president and CEO of the Indianapolis Motor Speedway. "It’s an honor to have Corvette lead the field and also to have the Chevy Indy V-8 competing for the win on May 30." 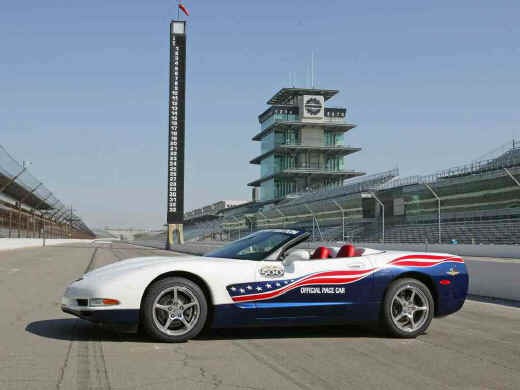 The 2004 Corvette that will serve as the Indy 500 Pace Car is virtually identical to the Convertibles available today through local Chevrolet dealerships. Like race cars, the duties of a pace car can be long and strenuous. During the last two races, for example, the Chevy pace vehicles cars led the field for a combined 84 laps (210 miles) of the total 400 race laps (1,000 miles) run, at an average lap speed of 75 mph. Even during green flag race conditions, the pace cars patiently run at idle, ready for action at a moment’s notice. Very few modifications were made to the Corvette to prepare it for this year’s role: heavy-duty transmission and power steering coolers, a lower restriction muffler system, four-point racing-type safety belts and a safety strobe light system. A white and blue two-tone paint treatment incorporates Americana-themed graphics, tying into Chevrolet’s new "An American Revolution" marketing theme. The theme captures Chevrolet’s pride and passion for innovation, and for success not only in motorsports, but also as it launches 10 new car and truck products in 20 months.